In September 2016, AVVN launched a new project entitled the National Garden Experiment (Nationale Proeftuin). The project involves a non-commercial, generally accessible seed exchange, on the website www.denationaleproeftuin.nl , via which garden enthusiasts can offer and obtain plant seeds, free of charge. Via the National Garden Experiment, we aim to help promote biodiversity in gardens. Biodiversity ensures a healthy natural system and allotment gardeners are the ideal partners to strengthen biodiversity by exchanging seeds. Promoting biodiversity is essential in the face of the decline in genetic plant variety. Due to large-scale agriculture and the food processing industry, more than 90% of calorie intake today is provided by just 30 crops. Variation between crop varieties is also declining. Nonetheless, it is essential that traditional diversity be maintained. We should give nature more space to develop, by preserving and extending our green heritage. Via the National Garden Experiment, we can inspire garden enthusiasts to experiment. It doesn't take much; even a flower tray is enough. For this digital marketplace, we developed a new website which is fully open to the public; in addition to allotment gardeners, anyone with a front garden, back garden or balcony can join in. There are a number of rules of play. Seeds must not be sold via the website; only exchanged or given away. Seeds must all originate from the participant's own crop or own garden. To prevent the undesirable spread of diseases, only healthy material must be offered. Anyone offering seeds or plant material simply places their own advertisement on the website. We encourage them to also give tips on the plant's needs such as location and soil, and the plant's characteristics such as colour, height and flowering season. Information about the added natural value of the plant, for example whether it attracts butterflies or bees, is also useful. Anyone visiting the site and interested in a particular seed simply sends an envelope containing a stamped and addressed reply envelope to the provider, stating the seeds they wish to receive. By bringing supply and demand together in this way, we hope to boost the vitality of nature in the Netherlands and make the world an even prettier place. This year the Haagse Bond celebrates its 75th anniversary with several eye-catching activities. 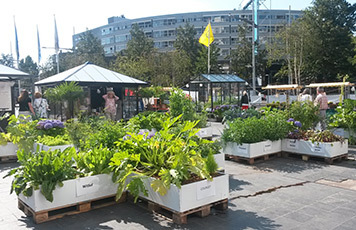 The most prominent was the exposition of a mobile demonstration allotment garden, made by the gardeners themselves, on "Spuiplein" in The Hague. "Spuiplein" is in the heart of the Dutch government centre, near the town hall, and is one of the most famous squares in The Netherlands. The Haagse Bond is a local society with 17 garden associations representing over 1,600 allotment gardeners. They used their anniversary to present themselves to the general public, to increase awareness of allotment gardening, to show the richness and diversity of their green and environmentally friendly hobby and to show the added value of allotments in the urban environment. The mobile demonstration allotment garden was built by many volunteers and staffed by them from 26th to 31st August, 2013. The garden attracted a lot of attention, from the shoppers, from officials during their lunch break and from tourists from many countries. In German, English and French they had all sorts of interesting talks about the hobby at home and abroad. The Haagse Bond has obtained much goodwill with the mobile demonstration allotment garden. Sustainability in the gardens is a hot item in The Netherlands. It is high on the agenda of our association and this is proven by the fact that this summer we have four new participating associations of our project National Quality Mark Natural Gardening. We will also visit 11 associations for a reassessment, so that the previously obtained quality marks can be extended with another 4 years. Furthermore this spring two new associations have been awarded the quality marks for the first time. 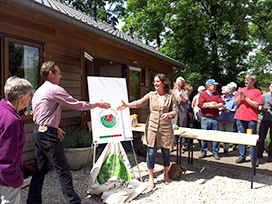 Two associations, Driehoek in Utrecht and Stadspark in Groningen, have asked to receive the diploma on an ecological gardening of the International Office du Coin de Terre et des Jardins Familiaux.